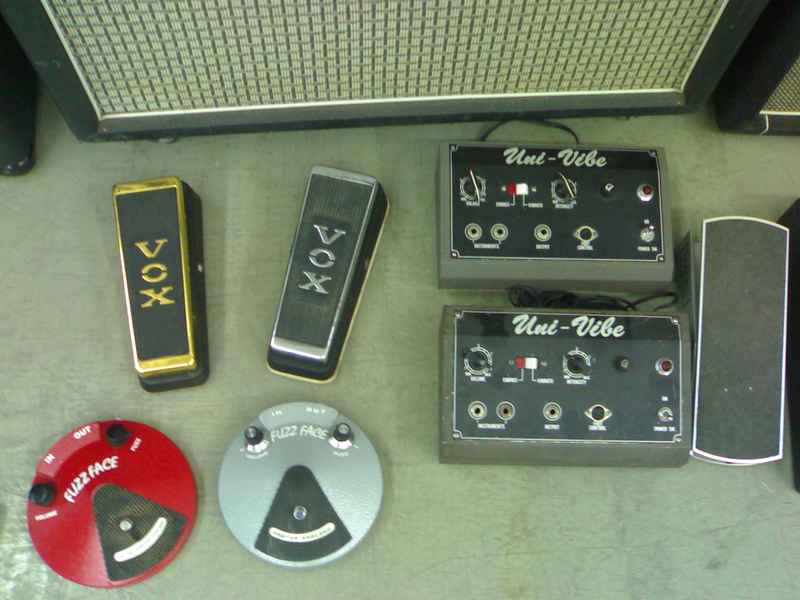 Guitarist John Mayer uses the Univox Uni-Vibe pedal in his guitar pedalboard. *Vintage Guitar* magazine created a "25 Most Valuable Effects" list and coming in at number 3 is the Univox Uni-Vibe pedal. "*Vintage*" writes in this article "If Hendrix touched it, you can bet it’s enshrined as effects legend. Originally intended mainly as a rotary speaker simulator for organ players, the ’Vibe – manufactured for Univox by the Shin-Ei corporation of Japan – was really a four-stage phaser with four pairs of light bulbs and cells for a liquid, juicy tone that hooks plenty of players from the first moment they hear it, and which caught fire big-time in the late ’60s. To hear the original, check out Hendrix’s “Voodoo Chile,” “The Wind Cries Mary,” or his performance of the “Star Spangled Banner” at Woodstock.."
Anastasio also plays through a Univox Univibe. "The Univibe, of course is made famous by Jimi Hendrix," the Phish guitarist said at (6:30). "I got it specifically because I spent 8 million hours listening to Band of Gypsies when I was growing up." "Trower’s hottest rig blasted his array of Strats through a pair of 100-watt Marshall JMP-100 Mark II heads feeding two 1960-B 4x12 cabs and had an impressive effects chain on the floor: custom preamp and clean booster pedals, a Dan Armstrong Red Ranger treble booster, a Tychobrahe wah-wah, an octave/fuzz Fender Blender, a Uni-Vibe chorus/vibrato, Mutron II phase shifter, and two Electro-Harmonix Electric Mistresses." In this article it is said that Bingham got a vintage Uni-Vibe by his friend John Gries. Bill mentions he used this in the Be Bop Deluxe period in the 70s. "The modulation effect on 'Sister Seagull,' (if I remember back so many long ago years,) was a Univibe and an MXR Phase 90." According to Marc Dorendorf himself, he uses a silver Vox Wah Wah as well as a limited edition golden Vox Wah Wah alongside a pair of original Uni-Vibe effects and Dunlop Fuzz Faces when playing Hendrix songs through his Marshall setup. The golden Wah Wah is also used with the big Soldano/Cornish system of Dorendorf's.